Today is the one-year anniversary of the death of Terri Schiavo, who starved to death because her husband didn't love her. This is the reality that comes with euthanasia - good people die and life and death are placed in man's hands instead of God's. when it is beset by weakness or injury. Lord, thank you for the life of Terri. and truth that life is always sacred. I just learned that Colorado is one step closer to allowing the purchase of the morning after pill without a prescription. This means that Colorado children would be able to purchase not only a sinful pill but one that may cause serious health risks. Governor Bill Owens of Colorado is unsure at this time if he will sign this bill into law. I am not a resident of Colorado, but I understand how important this is. Even if you do not live there, please contact Governor Owens and ask him to veto HB 1212, the bill that would allow the morning after pill without a prescription. Today we remember St. Stephen of Mar Saba, the nephew of St. John Damascene. This young saint was introduced to monastic life at the age of 10 by St. John Damascene. Later on in life, St. Stephen asked his superior at the monastery if he would be permitted to live a hermit's life of prayer. The answer - he could except on weekends when he was needed as a counselor. St. Stephen was a highly spiritual and prayerful saint although he also valued periods of quiet prayer and contemplation. During those times of prayer he would place a sign on his door: "Forgive me, Fathers, in the name of the Lord, but please do not disturb me except on Saturdays and Sundays." St. Stephen of Mar Saba died in 794 AD. One biographer of him wrote, "Whatever help, spiritual or material, he was asked to give, he gave. He received and honored all with the same kindness. He possessed nothing and lacked nothing. In total poverty he possessed all things." The Roman Martyr-Priest, Eusebius, whom the Arian Emperor Constantius II had imprisoned for seven months in the priest's own home so that he might slowly starve to death, is today our leader to the blessed Christ for whose Divinity Eusebius died and won eternal life.Two weeks from today, we shall celebrate the Lord's life-giving death—the source of our resurrection and life. Christ's death is the Sacrament of all sacraments. All the Christian mysteries flow from this main-spring: "the mystery of new life" "out of water and the Holy Spirit;" restoring or healing life in the tribunal of God's mercy; the reception of the Bread of Life at the Lord's Table; as well as the great "come forth" on the last day (from our tombs as Lazarus was called from his tomb). These and all other mysteries of our Faith are rooted in the death of the Lamb of God. Let us pray: O God, who renews the world by Thine ineffable sacraments, grant, we beseech Thee, that Thy Church may profit by Thy eternal institutions, and not be lacking in temporal help. Through Christ, Our Lord. Amen. Hear, Lord, the prayers we offer from contrite hearts. Have pity on us as we acknowledge our sins. Lead us back to the way of holiness. Protect us now and always from the wounds of sin. May we ever keep safe in all its fullness the gift your love once gave us and your mercy now restores. Amen. Earlier in the year I was very pleased to read that the world Catholic population has increased by 1.1%! This is substantial. In more recent, though equally joyful news, the Catholic Church remains highly frequented in Germany and France. Over the past year I've heard numerous reports of secularism taking over these two countries on CNN, so I was glad to finally have statistics. And the results are good for the Church. We just have to pray that more people in Europe practice the Catholic faith. In addition to this, there are over 24,000 priests and 100 bishops in France. 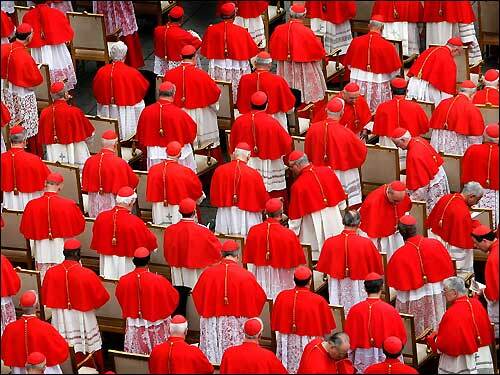 Germany, likewise is showing a strong Catholic population benefiting from the election of Benedict XVI to the papacy. Yet, the largest question remains as to whether these self-described "Catholics" are truly Catholic in the sense of Tradition. Near this church the penitents used to pass through one of the most infamous of places, near the crossroads of Mercury and the Serbian walls, where there was the merulana necropolis (cemetery). That was where pagan Rome left the bodies of slaves and criminals to rot in the open, until the Christians built a chapel with the aim of venerating the Christian martyrs.Two weeks from today, the Church will celebrate the mystery of the living and life-giving Bread, the first source of life and health. "For he that eats this Bread shall have life everlasting." "And unless you eat this Bread you shall not have life in you." Preceded by two stational saints, the first Confessors, who were given public veneration in the Church—St. Sylvester and St. Martin—we will go to God's altar, to the Mystery of Life, to Him who will say also to us:" I say to thee, arise!" Why do Catholics Light Prayer Candles? The Sight of burning votive candles -real or electronic - is common in most Catholic churches. The candles are usually placed before statues of saints or at shrines. But how did this tradition get its start? According to A Handbook of Catholic Sacramentals, by Ann Ball (Our Sunday Visitor Books), the practice of lighting candles in order to obtain some favor probably has its origins in the custom of burning lights at the tombs of the martyrs in the catacombs. The lights burned as a sign of solidarity with Christians still on earth. Because the lights continually burned as a silent vigil, they became known as vigil lights. Vigil Lights (from the Latin vigilia, which means "waiting" or "watching") are traditionally accompanied by prayers of attention or waiting. Another common type of candle offering is the votive light. Such an offering is indicative of seeking some favor from the Lord or the saint before which the votive is placed. Lighting a candle is a way of extending one's prayer and showing solidarity with the person on whose behalf the prayer is offered. After the 9/11 tragedy, lit candles figured prominently in a televised concert affirming the power of goodness over the darkness of evil. The symbolism was similar to the Catholic custom of lighting candles as a form of prayer. In the lighting of candles, we remember and truly live the words of Our Lord: "I am the Light of the World." In the lighting of candles we not only pray, but our prayers become smaller symbols of the One Light of Christ. In burning candles, our prayers rise up to Heaven day and night; prayers for the saint's intercession are also common because of their friendship with God in Heaven. Saints are powerful intercessors. The lighting of candles has been observed since the era of the early martyrs. 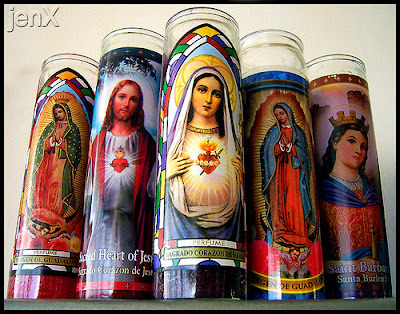 Click here to browse some religious candles for sale! I own several votive candles and nearly all churches have votive candles. Some churches ask for only a $1 donation to light one so they can purchase another, while some require up to $10. This is just to help them purchase new candles. Please realize it is a "donation", not an obligation; if you don't have the money, you will still be able to light a candle. There are many churches and Cathedrals over the Internet that will even light candles there for you if you send in a donation. If you would like to order a candle lit in a Church, one church that offers this service via the Internet is St. Gertrude. Today's Stational Church is at the beautiful Basilica of St. Paul Outside the Walls. At one time, a pilgrimage to the tomb of St. Paul in this Lenten penitential procession took on an exceptional character in view of the riches of doctrinal teaching, which has come down to us from the Apostle to the Gentiles. For this reason, it used to happen, that in this particular Lenten Station, the Pope carried out a "third scrutiny" for the baptismal candidates—that is, for those catechumens, who wanted to be baptized in water.In this church, at the tomb of this great convert-exemplar, the catechumens, turning westward—towards darkness—renounced Satan, his pomps and his works. Then, turning eastward—towards the light—they pledged their loyalty to Christ and His Church. Let us pray: O God, who grantest to the just the reward of their merits, and to sinners pardon through their fasts, have mercy on Thy suppliant people, that the confession of our guilt may enable us to obtain the forgiveness of our sins. Through Christ, Our Lord.Amen. Friday is the one-year anniversary of Terri Schiavo's death, and it is saddening that many states have not passed laws to protect the disabled. Terri Schiavo was not in a vegetative state and she was not in a coma. Terri Schiavo was disabled and her cruel husband allowed her to die. Today Michael Schiavo, her husband, is remarried. 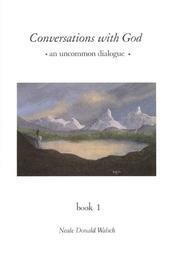 Michael Schiavo has just released a very immature book whose purpose was to "settle some scores" with Terri's family. Remember, her family was the one that wanted to take care of Terri. They wanted to take her under their care and pay for every expense. Michael Schiavo didn't want what was best for Terri, he wanted to get remarried! I'm happy to say that there is an alternative book that has just came out, this one by Terri's own family, the family that loved her. 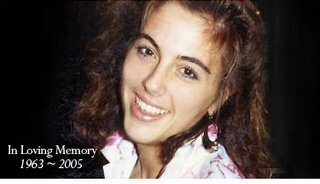 It's called A Life that Matters: the legacy of Terri Schiavo - a lesson for us all. This Friday we remember the one-year anniversary of Terri Schiavo's death. Let us, during this Lenten season of penance, remember her life. She is another statistic caused by the culture of death. Fr. Frank Pavone, National Director of Priests for Life, and an eyewitness to Terri Schiavo’s final hours, released the following open letter to Michael Schiavo tonight. Fr. Pavone read it to a worldwide audience on an internationally broadcast religious service on Sunday morning, March 26. A year ago this week, I stood by the bedside of the woman you married and promised to love in good times and bad, in sickness and health. She was enduring a very bad time, because she hadn't been given food or drink in nearly two weeks. And you were the one insisting that she continue to be deprived of food and water, right up to her death. I watched her face for hours on end, right up to moments before her last breath. Her death was not peaceful, nor was it beautiful. If you saw her too, and noticed what her eyes were doing, you know that to describe her last agony as peaceful is a lie. This week, tens of millions of Americans will remember those agonizing days last year, and will scratch their heads trying to figure out why you didn't simply let Terri's mom, dad, and siblings take care of her, as they were willing to do. They offered you, again and again, the option to simply let them care for Terri, without asking anything of you. But you refused and continued to insist that Terri's feeding be stopped. She had no terminal illness. She was simply a disabled woman who needed extra care that you weren't willing to give. I speak to you today on behalf of the tens of millions of Americans who still wonder why. I speak to you today to express their anger, their dismay, their outraged astonishment at your behavior in the midst of this tragedy. Most people will wonder about these questions in silence, but as one of only a few people who were eyewitnesses to Terri's dehydration, I have to speak. I have spoken to you before. Before Terri's feeding tube was removed for the last time, I appealed to you with respect, asking you not to continue on the road you were pursuing, urging you to reconsider your decisions, in the light of the damage you were doing. I invited you to talk. But you did not respond. Then, after Terri died, I called her death a killing, and I called you a murderer because you knew - as we all did - that ceasing to feed Terri would kill her. We watched, but you had the power to save her. Her life was in your hands, but you threw it away, with the willing cooperation of attorneys and judges who were as heartless as you were. Some have demanded that I apologize to you for calling you a murderer. Not only will I not apologize, I will repeat it again. Your decision to have Terri dehydrated to death was a decision to kill her. It doesn't matter if Judge Greer said it was legal. No judge, no court, no power on earth can legitimize what you did. It makes no difference if what you did was legal in the eyes of men; it was murder in the eyes of God and of millions of your fellow Americans and countless more around the world. You are the one who owes all of us an apology. Your actions offend us. Not only have you killed Terri and deeply wounded her family, but you have disgraced our nation, betrayed the Gospel of Jesus Christ, and undermined the principles that hold us together as a civilized society. You have offended those who struggle on a daily basis to care for loved ones who are dying, and who sometimes have to make the very legitimate decision to discontinue futile treatment. You have offended them by trying to confuse Terri's circumstances with theirs. Terri's case was not one of judging treatment to be worthless - which is sometimes the case; rather, it was about judging a life to be worthless, which is never the case. You have made your mark on history, but sadly, it is an ugly stain. In the name of millions around the world, I call on you today to embrace a life of repentance, and to ask forgiveness from the Lord, who holds the lives of each of us in His hands. Mother Church points today to two leaders: Moses and Christ—figure and fulfillment. Both of them were unappreciated by their flock. Both of them were unmoved in their consecration to God and their holy calling. Their people were superficial, proud and selfish, while they, the leaders, were filled with the spirit of prayer, humility and the love of God. In the spirit of our prayerful, humble and God-loving leader, St. Lawrence, let us make a sincere oblation of ourselves. Then the Divine Victim, through the prayers of this holy deacon, will increase in our souls what is so strikingly expressed in today's Mass:1. Humility—"With expectation I have waited for the Lord and he was attentive to me."2. Prayerfulness—"And He heard my prayer."3. Love—"And He put a new canticle in my mouth, a song to our God." Let us pray: Hear, O God, my prayer and despise not my supplication. Be attentive to me and hear me. Through Christ, Our Lord.Amen. I've just started a new poll at my blog (available near the bottom of my right hand sidebar). Please vote and in two weeks I will take the end results into consideration for my daily posting. Above all, I want this place to be a "daily dose" of the Catholic faith. Our life must be built on Jesus Christ and I try to get this across each day here. Yet He is the Bread of Life. Yet He is the Living Water. Yet He is our rest. Yet He is the King. Yet He cast out demons. Yet He wipes away our tears. Yet He redeemed the world. Yet He is the Good Shepherd. Yet by His death He destroyed the power of death. Beware of "Conversations with God"
I received this warning in an email and wanted to share it to my readers. After reading this review, I urge my readers to neither buy nor read this book. [One girl] poses the question "I am living with my boyfriend. My parents say that I should marry him because I am living in sin. Should I marry him?" His reply is, "Who are you sinning against? Not me, because you have done nothing wrong." Another question asks about God's forgiveness of sin[s]. His reply "I do not forgive anyone because there is nothing to forgive. There is no such thing as right or wrong and that is what I have been trying to tell everyone, do not judge people. People have chosen to judge one another and this is wrong, because the rule is "'judge not lest ye be judged.'" And the list goes on. Not only are these books the false doctrine of devils, but in some instances even quote (in error) the Word of God. These books (and others like it) are being sold to school children (The Scholastic Book Club), and we need to be aware of what is being fed to our children. Our children are under attack. So I pray that you be sober and vigilant about teaching your children the Word of God, and guarding their exposure to worldly mediums, because our adversary, the Devil, roams about as a roaring lion seeking whom he may devour (1 Peter 5:8). And how many of us know that lions usually hunt for the slowest, and weakest and YOUNGEST of its prey. Pass this on to every Believer you know. God bless! And, if in doubt, look at the books yourself. I wanted to pass this warning along. The sad truth is that there are numerous "spiritual" books that go completely against the Word of God. Please be cautious and vigilant in all you read. Trust God and the Church for anything spoken against either of them is a lie. The Station is on Mount Caelius, in a church erected in the seventh century in honor of four officers of the Roman army, who having refused to adore a statue of Aesculapius, received the crown of martyrdom. These were the "Four Crowned Ones," whose relics are venerated in this sanctuary together with the head of St. Sebastian, an officer of the army of Diocletian. Under the leadership of the Four Crowned Martyrs let us celebrate the divine Sacrifice. May the Eucharistic Action "refresh us and defend us," as it refreshed these great athletes and filled them with heavenly fortitude to go forth to make the supreme sacrifice for a true ideal, for their faith, for Christ, the King of Martyrs. I am a member of the Catholic Community Forum and have prayed for Tom's father before. Tom has posted about his father's ailing condition for a few months, and today I read the sad news that his father has left this world for the next. Please pray for my dad who passed away earlier this evening. As many of you regular visitors know, he had been sick with pulmonary problems for some time, and had a problem back in December. We are thankful dad had a good day today, and are quite naturally devastated by his loss. Thank you all for all your prayers and thoughts for my dad and our family. Please keep us in your thoughts over the next few days and weeks. Please offer your prayers and indulgences for this soul. Mary, in your arms, carry him to your Son, our savior. I really want to share my thoughts on today's liturgical readings at Mass. I have had numerous discussions on the role of faith versus works in salvation. And today I was struck by his passage: "For by grace you have been saved through faith, and this is not from you; it is the gift of God; it is not from works, so no one may boast." But, what does that mean? James 2:24 states, "See how a person is justified by works and not by faith alone." And James 2:26 goes further: "For just as a body without a spirit is dead, so also faith without works is dead." 162 Faith is an entirely free gift that God makes to man. We can lose this priceless gift, as St. Paul indicated to St. Timothy: "Wage the good warfare, holding faith and a good conscience. By rejecting conscience, certain persons have made shipwreck of their faith." To live, grow, and persevere in the faith until the end we must nourish it with the word of God; we must beg the Lord to increase our faith; it must be "working through charity," abounding in hope, and rooted in the faith of the Church. Everything makes sense now - we can only receive salvation through Jesus Christ! This is the key as today's Gospel states: "God so loved the world that He sent His only Son so that all who believe in Him might not perish but have eternal life." However, faith requires action. Faith is not a noun but a verb requiring us to a life for Jesus Christ. Ephesians conveys the necessity of faith, but faith cannot exist without living our faith through our daily actions and striving to become holy. This is what St. James is writing about in the Book of James. This two passages only make since when they are looked at in this context. I find this same truth in 1 Cor. 9:16, "For if I preach the gospel, it is no glory to me, for a necessity lieth upon me: for woe is unto me if I preach not the gospel." I am a member of the Holy Souls Prayer Group online, where I pray each day for the Holy Souls in Purgatory. A few weeks ago a poster there emailed me this excellent link to Mary's Way of the Cross. It is basically the traditional Stations of the Cross but from Mary's point of view. I wanted to share it with everyone here though I do most commonly pray the Traditional Stations of the Cross. The Traditional Stations of the Church are the ones that have the indulgences attached to them. The Stations of the Cross is a beautiful devotion during lent especially on Fridays. Exactly two weeks ago I posted about Catholics murdered in 2005 for their faith - they are examples that the Age of Martyrs Continues. Today, however, I came upon another story of a Catholic priest that was murdered - this one in 2006. Father Eusebio Ferrao was a parish priest in Macasana, India. When he did not show up for Mass on March 18th, several parishioners went to his home to check on him. He was found in his room on the ground with a pillow on his head and a towel in his mouth. He was smothered and strangled to death. There were also 27 stab wounds in his back and chest. This 61 yr-old priest died of asphyxiation according to forensic reports, and how painful it must have been. Again, we have another example of a man forced to die for serving Christ. Fr. Ferrao's funeral was March 21st, last Tuesday; 8,000 people attended the Mass. Please say a prayer for his soul. Update: I just learned through Zenit that Fr. Ferrao's killers were found. There were two men, Amit Shukla and Manish Dubey, that killed the priest. Amit Shukla had visited the priest several times looking for a job, and Fr. Ferrao was trying to help him find employment. This particular evening, Fr. Ferrao invited them over for dinner and let them sleep in an adjoining room because they had no way home. When Fr. Ferrao went to check on them, the two men jumped on the priest and murdered him. They quickly locked the room and boarded a train and were later caught. How could a man murder the very priest who was helping him. How horrible and tragic. Again, please pray for the soul of his priest. Let us pray: Extend to Thy faithful the right hand of heavenly help, that they may seek Thee with their whole hearts and deserve to obtain what they ask for worthily. Through Christ, Our Lord.Amen. Today is the Solemnity of the Annunciation of the Lord, where we recall that through Mary's obedience Jesus came was conceived in her womb. Today is March 25nd, 9 months before Christmas day. 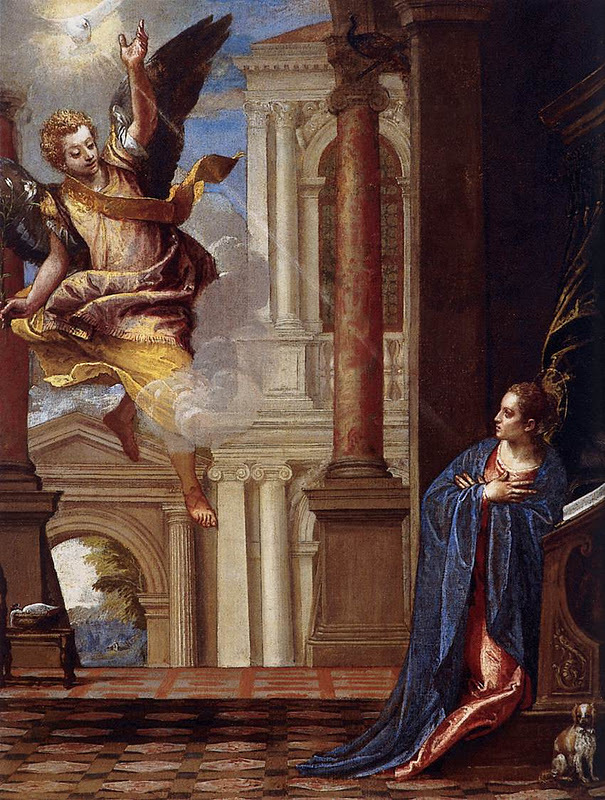 The Annunciation, set nine months before Christmas on March 25, was formerly such a great feast day in Christendom that it was the beginning of the civil/legal year in England until their transition to the Gregorian calendar in 1752, and remained a holy day of obligation for American Catholics until 1884. This High Feastday in the Church is of great importance, even if it is not a Holy Day of Obligation. On years in which the 25th of March falls on a Sunday during Lent, the Annunciation is transferred to the following Monday, March 26th. However, if March 25th falls during Holy Week, the Feast is transferred to the Monday after Low Sunday, since that is the first day after March 25th that is not a 1st Class Feast. Recall that all of Holy Week, the Triduum, and Easter Week are already 1st Class Feasts. At the Annuciation our salvation began - Our God came down and became one of us, destined to die for us. Through Mary's fiat (her "yes"), God became man and for nine months rested in her womb. Sadly, many mothers today do not understand the gift of life in their wombs so they resort to abortion. But was Jesus alive and fully human in Mary's womb! Abortion kills a living human person. Let us meditate on Jesus' love and an end to abortion today as well as Mary's role as Co-Redemptrix. Queen of heaven and earth, daughter of the Father, Mother of the divine Son, spouse of the Holy Spirit, I praise God for the unique grace given to you. Mary, you became the great Mother of our divine Savior, our Master, true Light of the world, uncreated Wisdom, source of all truth and first Apostle of truth. You gave the world the book to read, the eternal Word. For this I bless the holy Trinity and I ask you to obtain for me the grace of heavenly wisdom, to be a fervent disciple of Jesus and to be lovingly devoted to the Church, the pillar of truth. Make the light of the Gospel shine to the farthest bounds of the earth. Queen of the Apostles, pray for us! 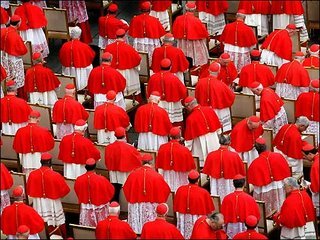 Today Pope Benedict XVI formally installed the 15 New Cardinals to the College of Cardinals bringing their number to 193. 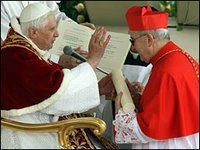 However, only 120 would be able to vote for the next pope as of now; only cardinals under 80 years old are eligible to vote. 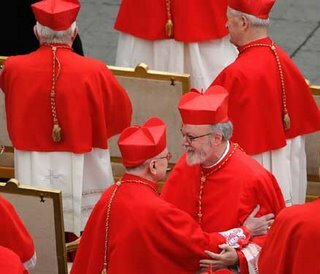 Basic information on the role of Cardinals in the Catholic faith can be found at the Catholic World News. Dear friends, Please pray for the soul of a wonderful man Mr. Simon Tee. He has gone to be with our Saviour yesterday after been admitted in the hospital for a couple of days due to very high fever and breathing difficulties. Please do also pray for his family to have the strength to go through this difficult time. "I have a burning thirst to be honored by men in the Blessed Sacrament, and I find hardly anyone who strives, according to my desire, to allay this thirst by making me some return of love" (Jesus to St. Margaret Mary). Today we have the greatest source of mercy and joy among us, but how many of us go to adore Him in the Eucharist? How many of us actually believe and live out that belief every day of our lives not just Sunday? The truth is that few people adore Jesus in respect to the number of Catholics in the world. Jesus Christ lives on just as He lived in Bethlehem. But again, only the humble Shepard-like people go out to meet Him. The Eucharist is truly the Body, Blood, Soul, and Divinity of Our Lord. There is nothing less wonderful about it; Jesus Christ is really present in the Sacred Host. I will continue to repeat this because it is so miraculous. Jesus Christ at the Last Supper instituted the Eucharist when He said to His Apostles: "This is my Body...For This is my Blood..." In Consecration the bread and wine cease to be bread and wine and truly become Our Savior. The only thing remaining of bread and wine is the appearance (called the accidents). Throughout history, there have been rare instances when even the appearance of bread and wine left. These Eucharistic miracles not only confirm the Real Presence but also that Jesus Christ remains with us. The Miracle of Lanciano, Italy (8th Century); Cascia, Italy (1300s); and Sienna, Italy (1730) are just two miraculous events. 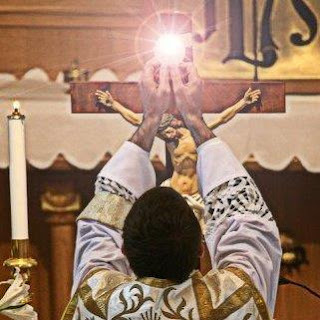 Only in the Catholic Church is Jesus truly present in the Most Holy Eucharist. This is the great proof that the Catholic Church is the one true Church of Jesus Christ. Do not doubt. In the words of St. Cyril of Jerusalem: "Since Christ Himself has said, 'This is My Body' who shall dare to doubt that It is His Body?" Today, we are making our pilgrimage to the church containing a large portion of the gridiron on which this holy Deacon made his last and most perfect oblation to God.It was during the forty years passed in the desert that Moses and Aaron asked God to bring from the rock-a figure of Christ-"a spring of living water," so that all the people could quench their thirst. During these forty days of Lent, the Church asks Christ to give us the living water about which he spoke to the woman of Samaria near Jacob's well-the water, which quenches our thirst forever. This water is our faith in Jesus. It is grace. It is the blood, which flows from the wounds of the Savior, and which through baptism, penance and the other sacraments, purifies our souls, and gushes forth into eternal life, of which it assures us a share. "Who Is Jesus to Me? Jesus is the Hungry to be fed. Jesus is the Thirsty to be satiated. Jesus is the Naked to be clothed. Jesus is the Homeless to be taken in. Jesus is the Sick to be healed. Jesus is the Lonely to be loved. Who Is Jesus to Me? Jesus is the Love to be loved. Jesus is the Joy to be shared. Jesus is the Sacrifice to be offered. Jesus is the Peace to be given. Who Is Jesus to Me? Jesus is the Word to be spoken. Jesus is the Truth to be told. Jesus is the Way to be walked. Jesus is the Light to be lit. Jesus is the Life to be lived." Today we continue the Stational Churches of Lent. Today's Station is the Basilica of Sts. Cosmas and Damian. "This church, made from two pagan temples, holds the bodies of the holy martyrs, Cosmas and Damian, who were put to death during the Diocletian persecution. The sick came in crowds to visit the tomb of these two brothers, doctors by profession, imploring them to restore their health. "The "unsalaried" physicians, Cosmas and Damian, devoted time and talents to the service of the poor and the sick, so that, by curing the infirmities of the body without remuneration, they might more easily win immortal souls for Christ. Today, the Divine Physician will again come and refresh you. He carries with him the divine antidote, the Eucharistic medicine for the healing of our infirmities. "Let us pray: May the blessed solemnity of Thy saints, Cosmas and Damian, magnify Thee, O Lord, by which Thou hast both granted eternal glory to them and assistance to us by Thy ineffable providence. Through Christ, Our Lord. Amen. " Why use the Phrase "Holy Father"? A reader of my blog asked a few days ago why Catholics use the title "Holy Father" in regard to the Pope. Now, Holy Father is not an official title of the Pope. As of this year, the Pope's official titles are "Bishop of Rome, Vicar of Jesus Christ, Successor of the Prince of the Apostles, Supreme Pontiff of the Universal Church, Primate of Italy, Archbishop and Metropolitan of the Roman province, Sovereign of the State of the Vatican City, Servant of the Servants of God." 1. On the part of the faithful, a filial, loving relationship, which recognizes in the one so addressed or spoken to, a mission of spiritual fatherhood, expressing that of God toward us, in the threefold charge confided to the Church of preaching the Good News of salvation, of sanctifying the believers, and of gathering together the dispersed children of God. This is a special and supreme responsibility of the Pope in the Church’s threefold mission of teaching, governing and sanctifying, as Prophet, Priest and Shepherd. 2. On the part of the one who is so designated, the responsibility to live this mission in perfect conformity to the will of Christ, “the Holy One of God,” to live what God already asked of His People through Moses: “Be holy, for I am holy” (Lv 11:44; 19:2). I ask today that you remember my dear Aunt Carolina Miruzzi, who, at the age of 91 years, was received into the arms of Jesus this very morning. She was given the grace of a happy and peaceful death, with her entire remaining immediate family at her bedside. She was unique among women, long-suffering and without complaint. May her graces shine down on us all. A reader of my blog just emailed me about news article on a possible Eucharistic miracle from our time. Actually, this miracle occurred in Dallas on March 19th, 2006, last Sunday, the feast day of St. Joseph! In the words of St. Cyril of Jerusalem - "Since He Himself has declared and said of the bread: This is My Body, who shall dare to doubt any more? Since Governor Rounds signed the landmark abortion ban into law March 6, 2006, a fund has already been created to defend it in court. As of Monday, March 20, 2006, $7,157 dollars had been collected. In addition, an unnamed donor has pledged to contribute $1 million dollars to defend it in court. This is fabulous news. LifeNews also reports that there appears to be no severe blow to South Dakota's tourism industry because of the law either. Tourism is the second largest industry in South Dakota with 2005 bringing in $809 million. Pro-abortion activists have promised to boycott travel to South Dakota if Governor Rounds signed the bill. However, there appears to be no effect. On the contrary, many people are now going to South Dakota because they support this ban on the cruelty of abortion. Blessed Mother Teresa - "Believe in Jesus trust in Him with blind and absolute confidence because He is Jesus. Believe that Jesus and Jesus alone is life and sanctity is nothing but that same Jesus intimately living in you; then His hand will be free with you.Give yourself unswervingly, conforming yourself in all things to His holy will. Love Jesus generously.Love Him trustfully, without looking back and without fear. Give yourself fully to Jesus. He will use you to accomplish great things on the condition that you believe much more in His love than in your weakness." Padre Pio - "Yes, I love the Cross, the Cross alone; I love it because I see it always on Jesus' shoulders" (Letters I, p. 377). We are nearly half-way through Lent. How has it gone for you? Has it been penitential and spiritually rejuvenating? Please continue to pray along the stational churches each day and meditate each day on the passion of our Lord. For the God of Glory didn't just love us enough to be born among us; instead, He opened us His arms and died to ransom us too. Today's Stational Church is the Church of St. Prudentiana. We turn to St. Prudentiana on this day. May she obtain for us by her powerful prayers:1. The grace of mutual forgiveness, so that we may be able to say in truth: "Forgive us our trespasses, as we forgive those that trespass against us"—Not seven times, but seventy times seven.2. The grace also of true love for our glorious Lord and for each other. Prudentiana shows us the way. Where charity and love reign, there is God. Christ will then be in our midst. 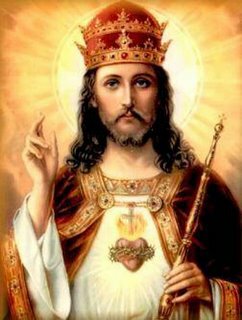 And He shall be the Savior, Lord and King of our hearts and our home. Let us pray: May the effect of our redemption be applied unto us, we beseech Thee, O Lord, by means of your grace, ever restraining us from human excesses and conducting us to the gift of salvation. Through Christ, Our Lord.Amen. Today is the Primary Election in Illinois, and if you are here go out and vote! We, as Americans, have the great privilege to vote. Your vote makes a difference especially in local elections! I also ask you to remember the unborn and pro-life issues as you vote. Please visit the Illinois Citizens for Life for the rankings of Illinois candidates according to pro-life issues. Please vote for the pro-life candidates and stand up for life. Many people don't know this, but it is considered a sin to vote for a pro-abortion candidate knowingly. Please say this prayer that the pro-life candidates will win. O Most Blessed Virgin Mary, Mother of Mercy, at this most critical time, we entrust the United States of America to your loving care. Most Holy Mother, we beg you to reclaim this land for the glory of your Son. Overwhelmed with the burden of the sins of our nation, we cry to you from the depths of our hearts and seek refuge in your motherly protection. Look down with mercy upon us and touch the hearts of our people. Open our minds to the great worth of human life and to the responsibilities that accompany human freedom. Free us from the falsehoods that lead to the evil of abortion and threaten the sanctity of family life. Grant our country the wisdom to proclaim that God’s law is the foundation on which this nation was founded, and that He alone is the True Source of our cherished rights to life, liberty and the pursuit of happiness. O Merciful Mother, give us the courage to reject the culture of death and the strength to build a new Culture of Life. Sadly, Amazon.com has bowed down to the pro-death society around us. 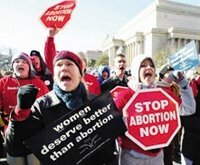 Seattle, WA (LifeNews.com) -- Amazon.com has modified its book search results after receiving complaints from abortion advocates who thought they were tilted in favor of the pro-life view. A pro-abortion religious group objected to Amazon asking customers if they wanted books on adoption when putting in the term "abortion" as a search phrase. Amazon made the change a few days ago. Before that, a question asking customers, "Did you mean adoption?" appeared at the top of search results for books on abortion. That upset Reverend James Lewis, a retired Episcopalian minister in West Virginia and a member of the board of the pro-abortion Religious Coalition for Reproductive Choice. What could be more deceitful that a minister advocating abortion! It's sad that in our society Christ's Church has been split up and there are some so-called leaders like James Lewis. I ask you to please contact Amazon.com and express your regret with their decision. I wanted to express my utter discontent with your recent decision for searching with the word "abortion". Beforehand, you would respond with "Did you mean adoption," but now you have removed this. Why? It is extremely important that people realize that adoption is an option for pregnant women. I am offended that your organization would bow down to the pro-abortion industry and remove this automated response. I actually have been planning on joining and purchasing through Amazon, but now I know that I'll have to choose EBay over your company because of this. I ask you to please add "Did you mean adoption?" again to your searches. "Jesus, whose divine love alone can redeem all humanity, wants us to share his Cross so that we can complete what is still lacking in his suffering (cf. Col 1:24). Whenever we show kindness to teh suffering, the persecuted, and defenseless, and share in their sufferings, we help to carry that same Cross of Jesus. In this way we obtain salvation and help contribute to the salvation of the world." 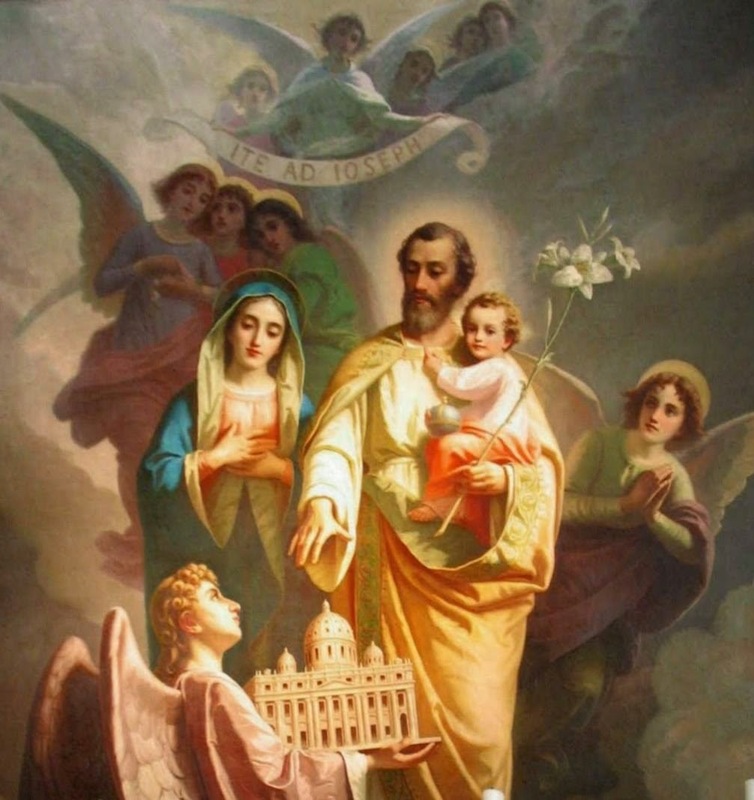 "We all have in him [St. Joseph] a model and a protector. 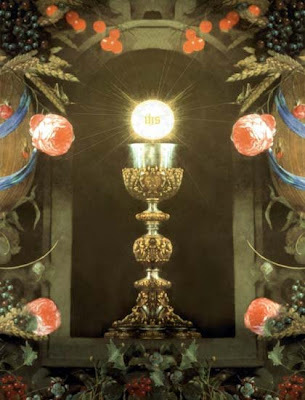 As adorers of the Sacramental Jesus, we continue near the Blessed Sacrament his service, his adoration and his love. He will watch over us and give us his spirit and virtues. Leading us to Jesus, he will say to Him: 'I cannot be on earth any longer to watch over You and serve You, but bless these adorers who are replacing me; give them the graces You gave me, so that their service may recall and replace mine.' How happy St. Joseph is to see us crowding about Jesus in His Sacrament, feeble, abandoned, persecuted, more in need of defenders and servants than in His Infancy . .. . .. Saint Joseph, be my protector, my model, and my father in my service of Jesus Eucharistic." It's so amazing to think that it has already been one year since Terri Schiavo's feeding tube was removed and she was left to die. March 31, 2006, will be the one-year anniversary of her death. From March 18-31, 2005, Terri Schiavo starved to death because the no one was allowed to give her a drink. In light of this and a continued effort by the culture of death to support euthanasia and abortion, I will join in a blog burst for Terri. For the next few days I will post on Terri's life, updates with her family, and hopefully, convey that life is far more valuable then we can rate it. Even the most disfigured and crippled life is far more valuable than you can imagine because he/she, too, was redeemed by Our Lord's blood. "There was no reason to pull her tube and put her through pain and discomfort," Ford, a nurse and spokeswoman for the Schindler Foundation at the time, concluded. "They could have capped her feeding tube off and prevented the pain she experienced from having a feeding tune pulled from her abdomen." I think it is appaling that our society would condone the painful death of Terri. Again our society was ripped open along political lines. Our inability to work together lead to her death. How can a modern society allow a woman's to starve to death for 13 days. How could over half our society do nothing to help Terri. How could Circuit Court Judge George Greer allow this. How could the Supreme Court refuse to stand up for the most basic principle of "life, liberty, and the pursuit of happiness." During that time of starvation, police arrested little children trying to bring her glasses or water. Our society condemned the rights of Terri's parents and instead let Michael Schiavo legally murder his wife. O, of course, he did it because he wanted what was best for Terri. That's why the media reported he originally denied her Communion. That's why he left her side and let her live her life alone in a room with closed shades and the radio off. Michael Schiavo didn't love Terri, and he didn't love God by doing what he did. Michael Schiavo could care less what is right! Look at Terri's father and the pain in his eyes. He didn't care about Terri, her parents, or Christ. He cared about himself and that is why, my friends, we are obligated to pray for people like that. We must learn to work together. Our country and the entire world must learn to value the infinite gift of life. On January 23, 2006, Michael Schiavo married a long-time girlfriend that he met in 1995. In 1998 he began to support hastening Terri's death. I see quite clearly what he cared about, and I hope that our society can see it too. O Lord and Master, Jesus Christ, you have redeemed us and made each of us your own children. Have mercy on us and save us from eternal damnation. Save our society which hates to follow your commandments and love one another as You has loved us. Cleanse us and make us a holy nation dedicated to loving You and serving the Gospel. For the Gospel is our life and it was the strength of Terri Schiavo. Let all that are condemned by a society rooted in "choice" to enter your glorious palace, my master and my king. For you know the pain of hunger and thirst. You know the pain of being unwanted. Have mercy on Terri's soul and her husband, who left her to die. Lord, save us and let us be one in union with you! Glorious, Jesus Christ Crucified, who suffered to save us, please have mercy on us all. Are these really "Catholic" Colleges? I just read an alarming piece of information concerning supposed Catholic colleges. The Cardinal Newmann Society has conducted reviews of websites by Catholic colleges and found some to include links and referrals to places like Planned Parenthood, the National Organization for Women, and NARAL, which all support the murder of the unborn. "Some of the violators include Boston College, DePaul University, Dominican University of California, Georgetown University, Loyola University of Chicago, Loyola University of New Orleans, Our Lady of the Lake University, Santa Clara University, Seton Hall University and the University of Detroit Mercy." Furthermore, "The College of St. Catherine in St. Paul, Minnesota, posts online information encouraging students to use abortifacient devices. " Thankfully, the Cardinal Newmann Society has faxed these universities asking them to immediately remove these sinful and alarming links. How deceitful that Catholic universities would post links to places that murder unborn children. I think we desperately need to include Catholic educators and schools to our prayers immediately. More information on this can be found at The Cardinal Newmann Website. 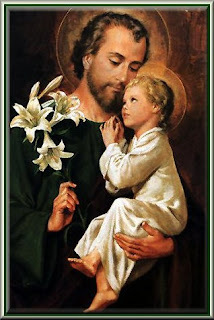 Today is March 19th and traditionally the feastday of the foster father of Jesus, St. Joseph. However, we do not celebrate his feastday today because Sundays in Lent always taken precedence over the day's saints. So, tomorrow we will celebrate his feastday. Today, I propose we prepare for this Solemnity tomorrow by meditating on the Seven Sorrows of St. Joseph. Please join me in praying and meditating on the Seven Sorrows of St. Joseph. Dear Saint Joseph, accept the offering I make to you. Be my father, protector, and guide in the way of salvation. Obtain for me purity of heart and a love for the spiritual life. 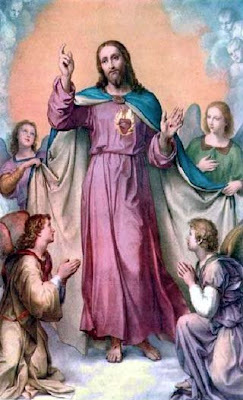 After you example, let all my actions be directed to the greater glory of God, in union with the Divine Heart of Jesus, the Immaculate Heart of Mary, and your own paternal heart. Finally, pray for me that I may share in the peace and joy of your holy death. Amen. O Most loving Jesus, I humbly beseech Thee that Thou wouldst Thyself offer to Thine eternal Father, on behalf of the Holy Souls in Purgatory, Thy Most Precious Blood, which pouredforth from the Sacred Wounds of Thine adorable Body, together with Thine agony and death. And do thou likewise, O sorrowful Virgin Mary, present unto the Heavenly Father, together with the dolorous passion of thy dear Son, thine own sighs and tears, and all the sorrows thou didst suffer in His suffering, in order that, through the merits of the same, refreshment may be granted to the souls now suffering in the fiery torments of Purgatory, so that, being delivered from that p[painful prison, they may be clothed with glory in Heaven, there to sing the mercies of God for ever and ever. Amen. Absolve, O Lord, the souls of all the faithful departed from every bond of sin, that by Thy gracious assistance they may deserve to escape the judgment of vengeance and enjoy the blessedness of everlasting light. Amen. O God, the Creator and Redeemer of all the faithful, grant unto the souls of Thy servants and handmaids, the remission of all their sins, that through our devout supplications they may obtain the pardon they have always desired, Thou Who livest and reignest world without end. Amen. St. Joseph is one of the greatest saints. His life is recorded partially in scripture, and we see a man dedicated to the Lord. 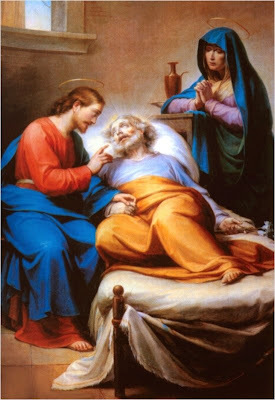 When St. Joseph could have had Mary killed for begin pregnant by another, he waits and listens to the voice of the Lord and his angels. St. Joseph has been called the Protector of the Redeemer. He was a man eager to do the will of God. "Let us allow ourselves to be infected by the silence of St. Joseph," Pope Benedict XVI recently said. "We need it very much, in a world that is often too noisy." Was he assumed into Heaven? "A homily on the Ascension that same year (May 26, 1960) afforded Pope John XXIII the opportunity to assert that it may be piously believed that St. John the Baptist and St. Joseph were bodily assumed into heaven at the time of our Lord's ascension." Why have a devotion to St. Joseph? For he it is who marks the closing of the old testament. In him the dignity of the prophets and patriarchs achieves its promised fulfillment. Moreover; he alone possessed in the flesh what God in his goodness promised to them over and again. Although We have already many times ordered special prayers to be offered up in the whole world, that the interests of Catholicism might be insistently recommended to God, none will deem it matter for surprise that We consider the present moment an opportune one for again inculcating the same duty. During periods of stress and trial -- chiefly when every lawlessness of act seems permitted to the powers of darkness -- it has been the custom in the Church to plead with special fervor and perseverance to God, her author and protector, by recourse to the intercession of the saints -- and chiefly of the Blessed Virgin, Mother of God -- whose patronage has ever been the most efficacious. The fruit of these pious prayers and of the confidence reposed in the Divine goodness, has always, sooner or later, been made apparent. Now, Venerable Brethren, you know the times in which we live; they are scarcely less deplorable for the Christian religion than the worst days, which in time past were most full of misery to the Church. We see faith, the root of all the Christian virtues, lessening in many souls; we see charity growing cold; the young generation daily growing in depravity of morals and views; the Church of Jesus Christ attacked on every side by open force or by craft; a relentless war waged against the Sovereign Pontiff; and the very foundations of religion undermined with a boldness which waxes daily in intensity. These things are, indeed, so much a matter of notoriety that it is needless for Us to expatiate on the depths to which society has sunk in these days, or on the designs which now agitate the minds of men. In circumstances so unhappy and troublous, human remedies are insufficient, and it becomes necessary, as a sole resource, to beg for assistance from the Divine power. Encyclical of Pope Leo XIII promulgated on August 15, 1889. We beseech Thee, O Lord, that we may be helped by the merits of the Spouse of Thy most holy Mother: so that what we cannot obtain of ourselves, may be given to us through his intercession: Who livest and reignest. For more prayers, devotional items, readings, etc. please visit Fish Eaters. I want to thank Rick of De Civitate Dei for creating Amateur Catholic. It's a blog for all Catholic bloggers that do not get paid for their blogging but just love being a part of the Catholic Blogsphere. 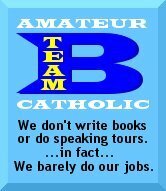 We're the B-Team of Catholic Bloggers. I will display the B-Team Logo with pride. If you haven't started to join me in praying each day this devotion, please do so. Every lent there are many pilgrims that journey throughout Rome to different Catholic churches. This devotion began over 1500 years ago, and today even though we can't physically be there, we can join the pilgrims spiritually. Please begin praying the Stational Churches. "This Station is in the basilica founded by St. Helen on the Via Lavicana, in which were buried the bodies of St. Marcellinus, priest, and St. Peter, exorcist, martyred at Tome during the Diocletian persecution. 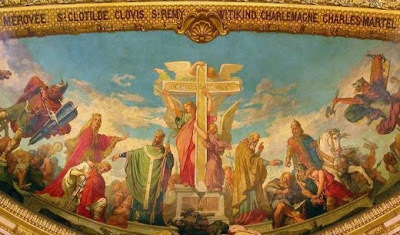 Their names are mentioned in the Roman Canon of the Mass. 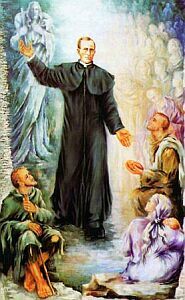 "May today's stational saints, not brothers in the flesh, but in spirit, obtain for us the gift of gratitude both for our holy calling—God's free gift—as well as for the grace of conversion, our homecoming to the Father. For the remainder of our life may "the unspotted law of the Lord, which converts souls, and the testimonies of our faithful Lord fill us with such wisdom that we shall show forth the glory of God, and declare the works of His hands." "Let us pray: Grant, we beseech Thee, O Lord, a saving virtue to our fast; that the chastisement of the flesh, which we have taken upon us may bestow new life to our souls. Through Christ, Our Lord. Amen. " The DVD, Fishers of Men, is now available at GrassrootsFilms.com. The DVD was requested by the United States Conference of Catholic Bishops to show the lives of priests. It is being called the best vocational film ever produced by the Catholic Church. You can view a trailer by visiting the USCCB website. I have been contacted by two separate people in emails begging me for prayers. They desperately need them but asked that I not go into detail on my blog. So, I will keep their names anonymous. Please offer up your prayers for these two for the Lord surely knows who they are. Eating Meat on St. Patrick's Day? Several dioceses around the United States have granted Catholics dispensations so that they may eat meat today in honor of St. Patrick this year since St. Patrick's Day this year is on a Friday in Lent. However, some dioceses have not granted dispensations. Typically all Catholics 14 years of age or older are bound to abstain from meat all Fridays of Lent. However, all Fridays of lent are still to be days of penance. If your diocese has granted a dispensation, (as mine has) please remember to either abstain from meat tomorrow or perform another act of penance today. The Diocese of Denver, Miami, Harrisburg, Penn., and Sioux City, Iowa said that abstaining from meat will still be required today. Mother Church points today to the "Great Friday" on which our High Priest and Redeemer obtained for us eternal redemption. She takes us today to the church of St. Vitalis—father of the holy martyrs, Gervase and Protase. For his loyalty to Christ, St. Vitalis was first buried up to the waist in an old cistern and then stoned to death. Here at the altar of this martyr—his name means "full of life"—Holy Mother Church directs our attention to the life-giving death of the Savior. In four weeks we will celebrate the life-begetting Passion of Christ. Pointing to this great mystery, the Church prays that we continue to prepare for it; that the holy fast may chasten us and make our hearts pure, so that when the vintage time of the Paschal solemnity arrives, the divine householder may not be obliged to say: "I looked that my vineyard should bring forth grapes, and it has brought forth thorns." May St. Vitalis, who drank so abundantly of the sacred winepress of the Lord's Passions, accompany us today to the Eucharistic Banquet in which this most Holy Passion is rendered present and the fruits thereof applied to our souls. Here all of us will become "Vitales"—living members of Christ—the Fountain of all life and holiness. Let us pray: Grant, we beseech Thee, Almighty God, that cleansed by this holy fast, we may be brought by Thee with pure hearts to the holy season, which is to come. Through Christ, Our Lord.Amen. The Feast of St. Patrick. Who Was St. Patrick? Today the Church celebrates the life of one of my favorite saints - St. Patrick of Ireland. St. Patrick was born around 370 AD in Scotland, and at the age of 16 he was kidnapped and sent as a slave in Ireland. St. Patrick was not a profoundly religious as a child, but in Ireland when he was sent to work as a shepherd, he began to pray. 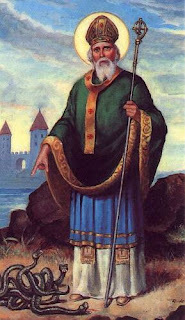 After six years of service and fervent prayer, St. Patrick received a dream where he was commanded to return to Britain. St. Patrick escaped Ireland and returned to Britain. In Britain, he entered the Catholic Church like his father and grandfather before him. 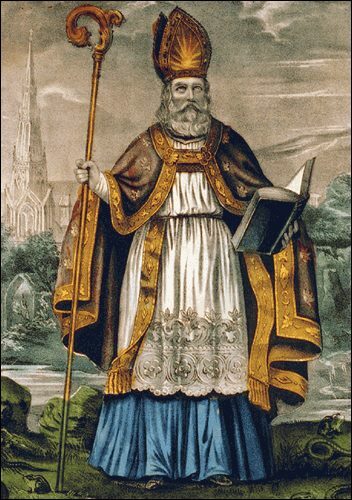 St. Patrick was ordained a priest by Saint Germanus in 432 and later a bishop. He later returned to Ireland to convert his people to Christianity. Pope Saint Celestine sent him to evangelize England, then Ireland. 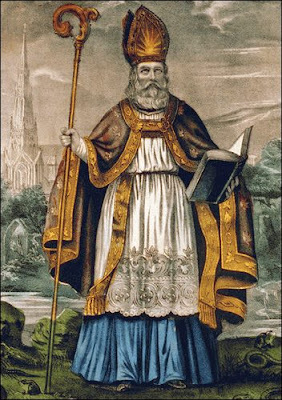 St. Patrick's chariot driver was Saint Odran, and Saint Jarlath was one of his students. 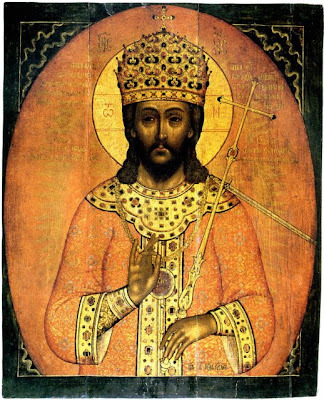 He advocated against slavery, idolatry, sun worship, and paganism! Shortly after his death, slavery was abolish in Ireland! Some reports claim he built between 300-600 churches and countless schools and hospitals. In his 33 years in Ireland, he converted nearly the entire country. He taught the Trinity by using a three-leaf clover. Because of his work, Ireland became know as the Land of Saints. St. Patrick died around 461 AD in Ireland, where he worked for years to evangelize. Today is actually a holy day of obligation in Ireland, Bank Holiday Ireland, and Northern Ireland. Also see the Novena Prayer to St. Patrick. O God, Who didst vouchsafe to send blessed Patrick, Thy Confessor and Bishop, to preach Thy glory to the nations: grant, by his merits and intercession, that whatever Thou commandest us to do, we may by Thy mercy be able to fulfill. Through our Lord.